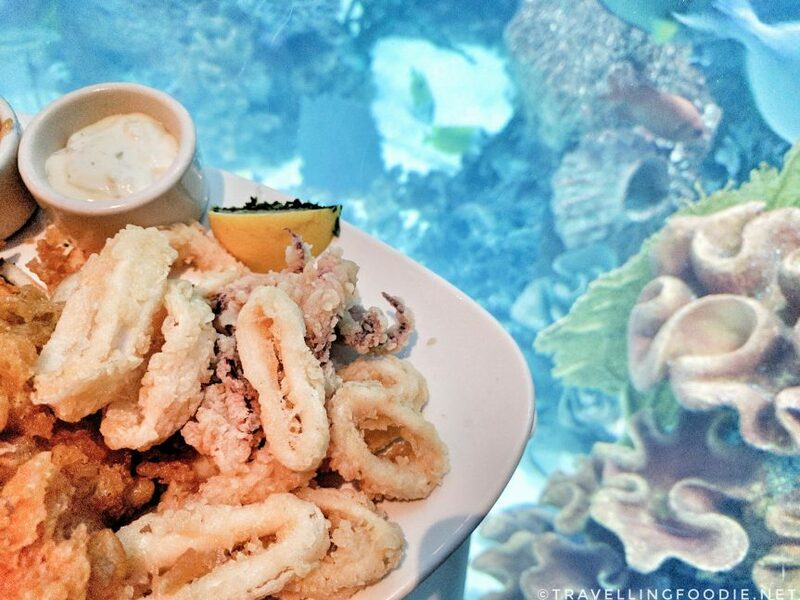 Chart House at Golden Nugget is a seafood restaurant featuring lots of seafood dishes and a 75,000 gallon tropical fish aquarium for your viewing pleasure while dining. I came here for lunch and sat right beside the aquarium, which I highly recommend. I found it awesome because it feels like I’m eating underwater. They were also cleaning the aquarium when I went so I actually saw 3 scuba divers inside the tank doing their work. Travelling Foodie Tip: Except for some select dishes, you can order the dinner menu during lunch. I dropped by the night before my lunch to ask this and to make sure what I wanted to order is something they can do during lunch. I ordered the Lobster Bisque and Specialty Platter. The Lobster Bisque ($7) had reasonable pieces of lobster. The bisque was creamy and had a good brandy taste. The cup is quite small so I would recommend getting the bowl for an extra $2. The Specialty Platter ($31) had tempura lobster tail (North Atlantic), fish (cod), coconut shrimp & calamari with skinny fries, fried sweet potato and plantains. This was such a great platter… to share. It is really quite fried food overload for one person to be eating. My favourites here were the calamari and lobster tail, as the taste of the seafood was still very strong. Travelling Foodie Tip: Request to have the fries, sweet potato and plantains on the side. What they did on mine was put all the fried seafood on top so it was hard to get them out and it became soggy faster. Disclaimer: Although the food was complimentary as provided by Golden Nugget, all opinions are my own. Posted on January 29, 2017 by Travelling FoodiePosted in Food, Las Vegas, Nevada, USATagged restaurants.